True sweet scented narrow leaved species often called English Lavender , but it is actually native to limestone hillsides of France/ Italy, Although it will tolerate very low Winter temperatutres. ( Down to -20*) Like all Lavender it needs a Sunny well drained position. 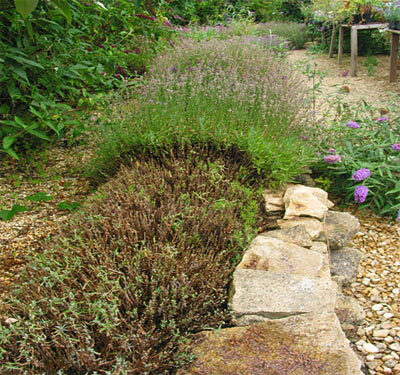 Most angustifolia cultivars will make excellent hedging plants. Flowers in June July. Top varieties include Little Lady, Hidcote, Folgate, Hidcote Pink, Imperial Gem. We recommend pruning as soon as main flowering is past its best. Somewhere about second week in August. I always say a good way to remember is 888 ! Prune on the 8th day of The 8th month (8th of August) to about 8 inches high in the centre of the plant from the ground. In a mound shape. Through the last weeks of Summer, the plant will put on a small amount of growth,1/2inch or so and green up into a tidy hillock of lavender. Looks great through the Winter and doesn't need pruning again in the Spring. Forget about pruning until 8th of August the following year, Then prune to the same height, guess what? Yep 8 inches again. EASY! This way the Lavender doesnt get gradually taller and doesn't become Woody as the years go by! So many times people come in the Nursery and tell me that after 3 or 4 years Lavender goes woody and they have to replace it? Try Following this simple method and Ten years later (hopefully) you can still have a compact low Hedge. Will green up thro' Aug/Sep.